Any post in this category contains a presentation that I have given that you can download for viewing. As always, if you have any questions I am happy to answer them – get in touch with me through the “Contact” page. 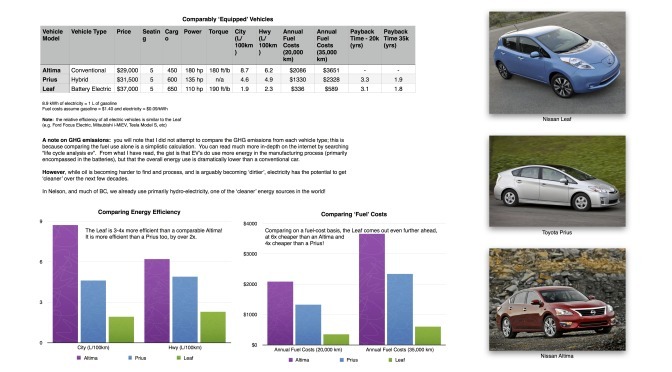 I participated in the Nelson EcoSave Green Energy & Home Show again this year as an Electric Vehicle (EV) ambassador. I also gave a short 5 minute talk and 3 minute Q&A afterwards. 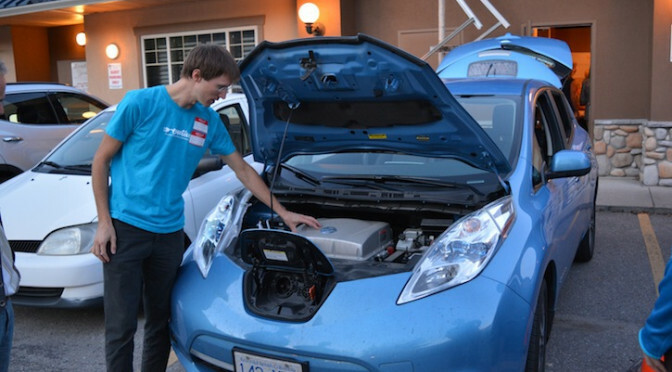 Many people were there to look at the EVs; Murray took a number of people for a ride in his LEAF, and Dave in a Tesla Model S also came down from Rossland. I also brought our electrified Edgerunner cargo bike. Lots of interested people with many many question! This post contains the presentation I gave, along with a number of “infographics” that I prepared and left on a display table for the public to view while at the Home Show. Click on any of the files/images below to download or to view as a larger image. As mentioned in my last post, I was invited to attend the 2nd annual Nelson Green Home and Energy Show on October 15th. I had a great time at the show and really enjoyed answering the different questions that people had and showing them the Leaf in person. how far can you drive on one charge? how do you charge the car? how did you get it to Nelson?